Results: Psychologist October 2017 Board Exam (List of Passers, Topnotchers, Performance of Schools) - Balita Boss! 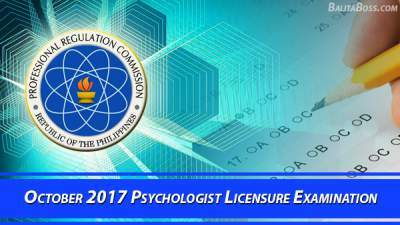 The Professional Regulation Commission (PRC) released the official results of October 2017 Psychologist Licensure Examination on Tuesday, November 7, 2017. A total of 96 out of 148 examinees passed the October 2017 Psychologist Board Exam, according to PRC (via PRC Website). ANNA CRISTINA ANGELES TUAZON, a graduate of UNIVERSITY OF THE PHILIPPINES-DILIMAN, ranked first in the October 2017 Psychologist Board Exam with a rating of 82.90 percent. To download the October 2017 Psychologist Exam Board Topnotchers, please click here or here. To download the October 2017 Psychologist List of Passers, please click here. To download the October 2017 Psychologist Performance of Schools, please click here or here. With 20 or more examinees and with at least 80% passing percentage, DE LA SALLE UNIVERSITY-MANILA emerged as the top performing school in the October 2017 Psychologist Board Exam as per Commission Resolution No. 2010-547 series of 2010, with 82.61% passing percentage or 19 out of 23 examinees passed the exam. Psychologist board exam covered the following subjects: DAY 1 - Advance Theories of Personality (20%) and Psychological Counseling and Psychotherapy (25%); DAY 2 - Advancce Psychological Assessment (30%) and Advance Abnormal Psychology (25%). The Board of Psychology who administered the October 2017 Psychologist Board Exam are Ms. Miriam P. Cue as Chairman, with members namely Ms. Alexa P. Abrenica and Ms. Imelda Virginia G. Villar. The date and venue for the mass oathtaking of the successful examinees in the October 2017 Psychologist Licensure Examination WILL BE ANNOUNCED LATER, PRC said. During the last examination conducted last August 2016, a total of 63 out of 120 passed the Psychologist board exam, PRC announced. CHERIE ANN TAM LO topped the August 2016 Psychologist Board Exam with a rating of 81.80%.